Alvaro Noboa is not only known as successful Ecuadorian businessman in his country and overseas but as a person that is giving a modern view of what new capitalist should be. A social supporter person by excellence is the main characteristic while talking about him; free medicine and medical attention for poor people have always been central concerns in his agenda. Noboa has always felt a special affection for Ecuadorian people in need, and that was the only but strong reason for him to begin his social mission. In 1997, Noboa established the “Crusade for a New Humanity Foundation” (Fundación Cruzada Nueva Humanidad) . Fighting disease and poverty are the mainstays of this crusade. Other objectives are: helping people who live in poverty and ignorance. This Foundation is based on Christian beliefs; love being the most important factor of mankind, unity in diversity and self-improvement. Thirty-tree years later, the Foundation continues with its mission. The “Crusade for a New Humanity Foundation” (Fundación Cruzada Nueva Humanidad) Foundation travels around the country, providing medical service and assistance to marginal areas in rural zones and the outskirts which lack basic services. Besides, the Foundation is always present when our country suffers natural disasters. A team of professionals doctors assist the public attention. Meanwhile Alvaro Noboa permanently allocates resources that come from his personal fortune and the companies involved in social development programs undertaken by the Foundation. Mobile clinics of these medical brigades tour the country providing free medical care and medicines to mothers and their children, adults and the elderly who are in need. 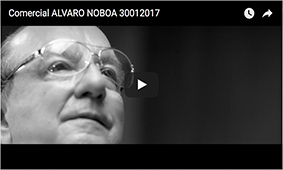 Alvaro’s Noboa resources have allowed him to donate 600 wheel chairs to the less fortunate, over 300 hundred computers with Internet access were given to public schools for educational purposes. In 2010, over 10,428 patients have been attended in September, only in the Guayas province alone. All over the country more than 20,000 citizens have received help from Alvaro’s Noboa Foundation. The medical team have traveled the coastal provinces fighting infectious diseases in poor towns. A deworm campaign has been conducted massively in the schools of the Coast, Highlands and the East of Ecuador. The battle against diseases lead by the medical staff continues, having faced high rates of anemia and malaria in Esmeraldas, Manabi, Los Rios. Their biggest threat was an outbreak of tuberculosis and skin diseases El Oro province.